Following the basic philosophy of modeling excellence -- that our most important teachers are those who have succeeded, the essence of the master-apprentice relationship -- this book is the next best thing to having the top screenwriters in the business be the reader's personal mentors as they guide and inspire him or her to adopt the mind-set and commitment inherent in being a professional screenwriter in Hollywood. The difference between successful writers and aspiring writers is that successful writers do all the things that aspiring writers won't do, can't do or don't know how to do. Common sense dictates why not look at what successful writers do specifically and do the same. Designed for beginning writers as well as those more experienced who seek to jump start their career to new heights, this book focuses not on how to write a formulaic script but on what it takes to become the writer who creates a unique one. 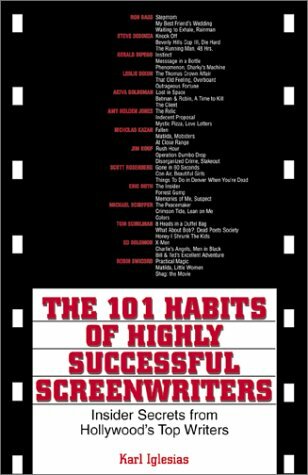 Whereas most screenwriting books attempt to teach the reader what to do, this book outlines, by studying those who are already doing it successfully, how to do it, stressing the key habits, so that the 'how' becomes second nature to the reader. Its structure offers a powerful and unique twist on the few established interview books by arranging the screenwriters' comments by topic rather than by individual interview, thereby following a more efficient model of accessing information needed by the reader. Rather than waste time reading a whole interview to pinpoint nuggets of information, the reader can refer to a specific topic and read what a group of successful writers have to say about it. Study their habits, learn from them, and maybe their wisdom will rub off on you and arm you with enough knowledge and self-confidence to accomplish your goals. I've actually learned quite a bit from the book. One of the things that I found really informative was how the screenwriters both write and develop new projects simultaneously. While they spent the majority of their day working on their current script, they take a few hours at the end of it to develop the next one. That way, once they finish the first draft of the current script, they are able to immediately begin writing their next one. The advantage to this is that you're never putting too much time, energy, or focus on any one script, which means that if it's not perfect, or doesn't sell, it's not the end of the world because you have five more in the pipeline. That's something Travis and I are going to start doing. Whereas before we would just write the one script and work on it till we were satisfied, and then move onto the next, this way we hope to start cranking out a lot more. And this is an important skill to have because if you sell a pitch and are getting paid to write, you have maybe 12 weeks to deliver the first draft, in addition to whatever other project you're getting paid to work on. Multi-writing is definitely a skill. And it just allows you to start pumping out the scripts. I project that Travis and I will write, at minimum, three scripts this year, with at least one more most likely. What I also like about the book is that it's not about the craft of screenwriting but about everything else you do around writing a script.